With publishing margins whittling away, it's important that you make the most of your content -- that means utilizing different permissions channels to increase revenue, analyzing your content usage to make more strategic business decisions, and using your staff's time effectively. In order to ensure that you're capturing maximum dividends from your content, we've developed this complimentary whitepaper. 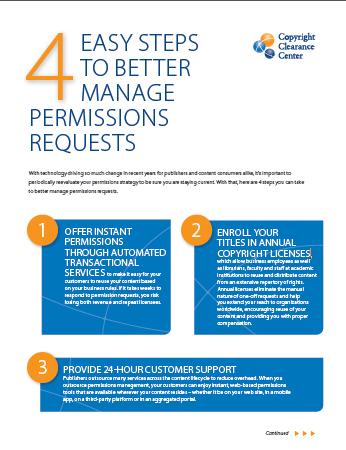 More than 35,000 organizations depend on CCC solutions to simplify copyright compliance. Download your tip sheet now!